Speaking (again) of our "hidden wound"
I don't care. Really. Except this "Cover of the Rolling Stone" story caused NPR to dredge up the Shel Silverstein song that only people as old as me will remember, and to take that lighthearted, silly, JOKE song, seriously. Evil does not drag its knuckles, or shave its head, or cover itself in tattoos, or have a particular skin color. It can be young and genial. Which seems to be how this picture can support the cover story. But the reactions to it...well, like Charles Pierce: I don't get it. Lawrence O'Donnell outdid himself last night over this story, ranting on and on about how Tsarnaev's friends couldn't understand how Tsarnaev would do this, to the point O'Donnell described them all as "oblivious" and obviously wanted to round them all up and put them in jail for not telling him what he wanted to hear. And I got the feeling that, if he could, he'd buy up every copy of RS and burn it in a bonfire lit on the ruins of the RS building, after which he would sew the ground with salt and piss on the ashes. Because, ya know, evil is fookin' evil, m'f'er, and it should look evil! Or something. And besides, kids these days! They don't even know what evil is when they're standin' right next to it! What good are they? Why should anybody else interview 'em after O'Donnell did? 'Cause, they're oblivious! The man was ranting about this. It was almost embarassing. As a pastoral care matter, I can understand such personal reactions. But as a public news matter? If the news is that slow, let's all just do what the trial lawyers used to do in August: take the next six weeks off and go on vacation. And it does make me reconsider the power of "social media." It was all well and good when Juror B37's book deal fell through (gross commercialism, 'n' all), but that's all RS is doing: putting a picture on the cover that will sell issues on newsstands. But, ya know, gross commercialism, 'n' all. It's a fine line between legitimate outrage and knee jerk mob rule. Not that I really care what happens to Rolling Stone magazine. But now that I'm commenting on it, I do wonder about what makes people outraged, and how they express it. And Shel Silverstein? When we're taking Shel Silverstein lyrics seriously in a news story, it's time for everybody to take six weeks off and lighten up. 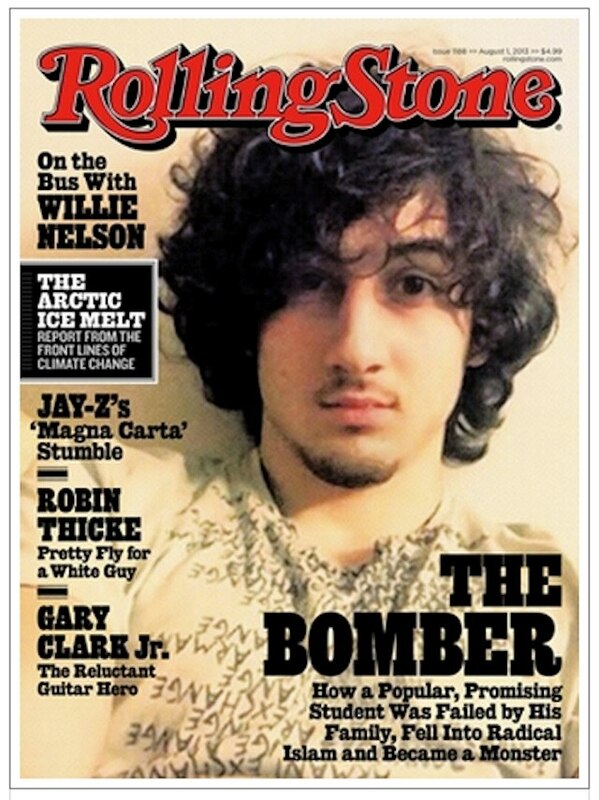 Well, you've got to say one thing, those guys at Rolling Stone sure know how to generate buzz. Another thing you can say is that the manufactured outrage business has sure benefited from the world-wide-web. I'm old enough to remember when it was pretty much Joe Pyne who had a monopoly on that around here. I can't believe how much liberals are like right wingers when it comes to this kind of stuff, but I stopped going you-know-where a while back. Yeah, never thought I'd miss the days of Joe Pyne. At least he was relegated to late-night TeeVee, right before the test pattern came on and we all knew to go to bed. Now? Everybody has to be outraged about everything, else how do you know you're alive? I'm old enough that I only ever heard him on the radio. I didn't even know his name was spelled with a "y" until recently. When we're taking Shel Silverstein lyrics seriously in a news story, it's time for everybody to take six weeks off and lighten up. I dunno. I figure taking Shel Silverstein lyrics seriously represents social progress. Yeah, but once NPR does something like that you know they'll do slight variations on it for the next ten years. I mean,it's only a matter of time before the next Les Paul or Leon Fleisher's little finger story is on.